RIO DE JANEIRO, Brazil (Aug 22, 2016) – It was on Day 2 of the Olympic taekwondo competition at Carioca Arena 3 in Rio’s Barra Olympic Park that history was written. 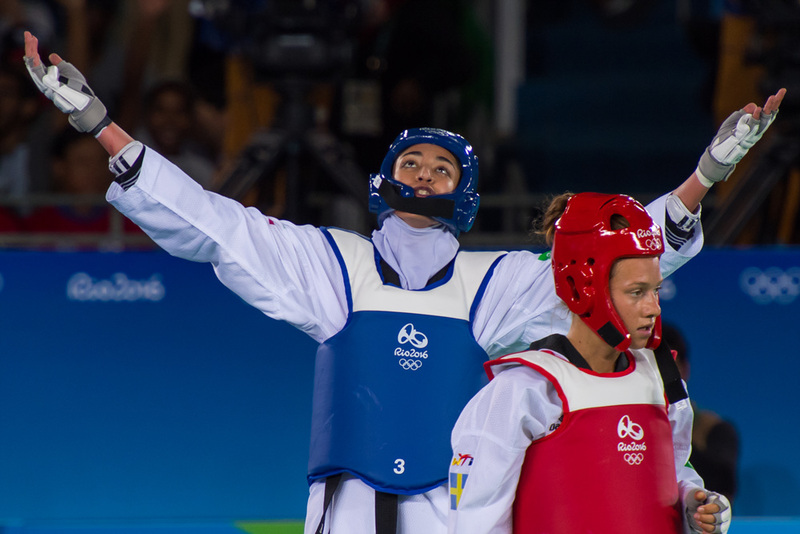 The final buzzer rang on the bronze medal match in the women’s -57kg category and an 18-year-old athlete from Karaj, Iran had done something that had never been done before: Kimia Alizadeh Zenoorin was the first female Iranian athlete to win an Olympic medal – not just in taekwondo, but in any discipline. Taking on Sweden’s Nikita Glasnovic, the Iranian asserted her dominance early and extended it with a head kick that drew roars from the crowd. The Swede, despite firing off countless kicks, was unable to find the range and Alizadeh Zenoorin – after a final- seconds countdown from the crowd – won with rare conviction. She ended it by falling forward and kissing the field of play, then embracing her coach and taking photos with the crowd. Even so, the color of her medal is overshadowed by the enormity of her achievement. “When I came here I wanted to break this enclosure, open the door, help other female athletes and also create a kind of self-confidence for people to go out there and do it,” she said. Her country has fully recognized the significance of what has happened. Iranian media are full of her pictures; her photo portrait has been emblazoned across a giant poster decorating a central Tehran overpass; actors and celebrities are lining up to congratulate her when she lands; there are even clips up on social media of inspired Iranian grandmothers performing zany taekwondo moves. Alizadeh Zenoorin’s unexpected triumph – she was the Olympic 10th seed and her world ranking is 21st in a tough category that includes such high-profile stars a Team GB’s Jade Jones, Spain’s Eva Calvo Gomez and Egypt’s Hedaya Wahba – may mitigate the disaster that befell the Iranian men. 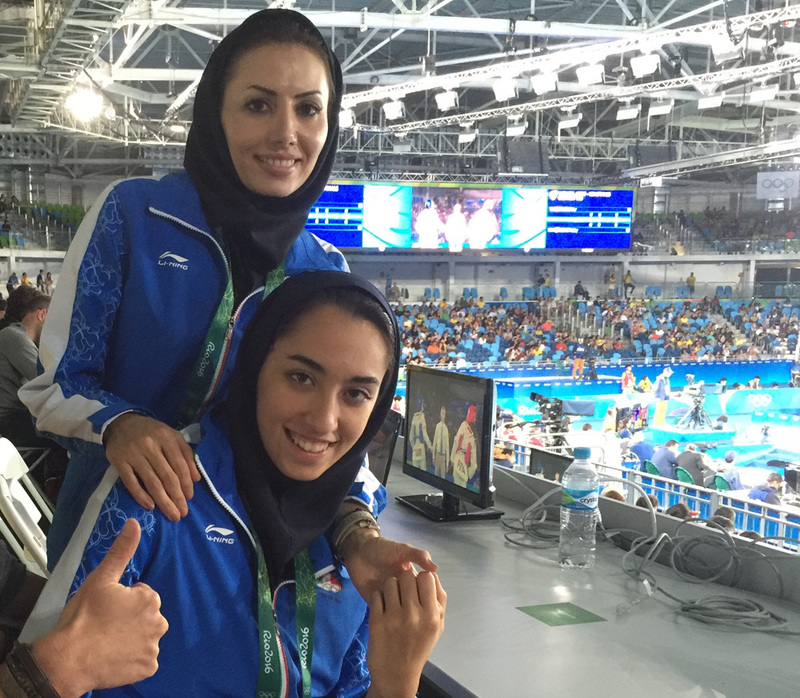 Iran is a taekwondo superpower and the team it fielded in Rio was best-of-breed. But from Day 1, it all fell apart. Farzan “The Tsunami” Ashourzadeh Fallah, the number-one seed and the favorite to win the -58kg went out in his very first match. Mahdi “The Terminator” Khodabakhshi was the number-one seed and the favorite to win the -80kg: He went out in his second match. Sajjad Mardani, the number-two seed and a strong medal possibility in the men +80kg also went down in his second fight. The Rio results indicate that the rest of the world has finally worked out how to beat the Iranian powerhouses. Those matches must have been hard for Alizadeh Zenoorin to watch. And her own preparation for Rio was agonizing. “Obviously, it was hard to come here and I had a lot of stress,” she said. “I lost 10 kilos to be ready for this competition!” (Given that Alizadeh Zenoorin fights in the -57kg category, the extreme nature of that weight loss may be appreciated.) Still, the reward has been worthwhile. ”I worked hard to get a medal. I thank God for this opportunity and I hope to be a good role model,” she said. At home, she is a student who, between classes and taekwondo sessions, enjoys hiking and climbing. In the future, she plans to finish her university degree in physiotherapy, become a physio, and teach taekwondo. But given that she is aged just 18, there is more immediate business awaiting her on competition mats worldwide. 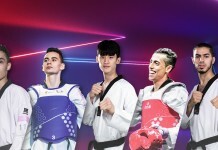 She cites Iranian taekwondo legend Hadi Saei, Team Korea bronze medalist Dae-hoon Lee and Team China double Olympic gold medalist Jingyu Wu as her inspirations in the sport. With her height – she is a good head taller than Jones – and her weaponry – her round kick to the body is a consistent scoring technique – she has all the right physical qualities to win more medals. Her immediate goal is next year’s World Championships in Muju, South Korea. “Nobody from Iran has taken gold at the World Taekwondo Championships in the females so I would like to go there and win that medal, too,” she said. And in four years – aged just 22 – it will be Tokyo 2020. “When I arrive in Iran, I want to rest to heal my injuries, then work hard to change the color of the medal I have now,” she said.